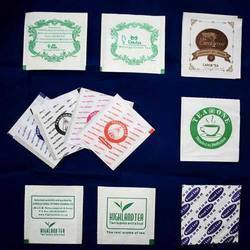 Tea bag tags are available in 2 types – paper-PE laminates / PET-Paper-PE laminates. The tags are printed in reels using flexo or gravure process. The reels are mounted on the machines. Separate reels are required for the front and the back, so it is possible to have 2 different designs for each side of the tag. . The print is continuous. Looking for Tea bag Outer Sachet ?